r WordPress 5.0 is Out Now. Contact Us to arrange your upgrade today. What are the areas to focus on when building a new website? So you’re building a new website? Not sure of where to start? Today we discuss the areas that are most critical to focus on and get right while building your new website. ‘Beauty is in the eye of the beholder’, effective web design is judged by the users of the website and not the website owners. There are many factors that affect the usability of a website, and it is not just about form (how good it looks), but also function (how easy is it to use). Websites that are not well designed tend to perform poorly and have sub-optimal Google Analytics metrics (e.g. high bounce rates, low time on site, low pages per visit and low conversions). So what makes good web design? Purpose – Good design caters to the users needs. Are your users looking for information, entertainment or to make a transaction. Each page of your website needs to have a purpose and to fulfil a need for the user in the most effective means possible. Communication – Users want information, quickly. It is important to communicate clearly, make your info easy to read and digest. Some ideas include organising info using headlines and sub headlines, use bullet points instead of long sentences. Typefaces – Sans Serif fonts such as Arial and Verdana are easier to read online. An ideal font size for reading easily online is 16px. Restrict your website to a maximum of 3 fonts in a maximum of 3 sizes to keep your website optimal. Colours – A good colour palette will go a long way to enhancing the users experience. Complement your colours, using contrasting colours for text and backgrounds will make reading easier for the user. Vibrant colours evoke emotions and should be used sparingly, and finally using white space/negative space is essential at giving your website a modern uncluttered look. Images – A picture can speak a thousand words, and selecting images for your website can help with brand positioning and connecting with your target audience. If you don’t have high quality professional photos on hand, consider purchasing stock photos, or find many free stock photo websites also to lift the look of your website. Also consider using infographics, videos as these can be much more effective at communicating than text. Navigation – Navigation is about how easy it is for users to take action and move around your website. Some tactics for effective navigation include a logical page hierarchy, using bread crumbs, designing clickable buttons, and following the ‘three click rule’ which means users will be able to find the information they are looking for within three clicks. Layouts – Placing content randomly on your web page can end up messy. Grid based layouts arrange content into sections, columns and boxes that line up and feel balanced, which leads to a better looking website. “F” Pattern – It has been discovered that users scan computer screens in an “F” pattern. Most of what people see is in the top and left of the screen and the right side of the screen is rarely seen. Effectively designed websites will work with a reader’s natural behaviour and display information in order of importance (left to right, and top to bottom). Mobile Friendly – It is essential to have a mobile friendly website now a days. Your website should be but to be responsive (visible on all screen sizes). If your website does not work on a mobile, it can be rebuilt, or a seperate dedicated mobile website could be created. 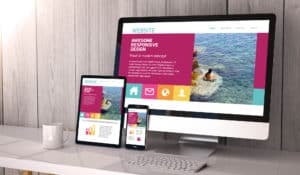 These principles of effective web design can help your website be more engaging, useful, and memorable for visitors. It is Matt here. I'm passionate about helping business owners build and manage successful websites so i'll be sharing tips and ideas to help you get more out of your website.